We all know how much I loved the Food Hall at Daimaru in Kyoto, so here are some more photos I found from the depths of my Japan trip photos. 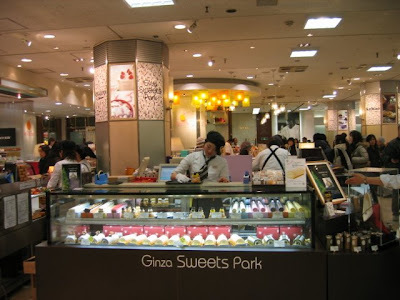 I am crazy about the food halls in Japan's department stores, and only wish we had something like them in Australia. The beautiful store layouts! The approachable, unintimidating service! The beautiful packaging! And most importantly, the incredible quality and array of gorgeous foods from all over the world. Here are a few highlights from our heart-stopping, wallet-draining trips to Japanese food halls. 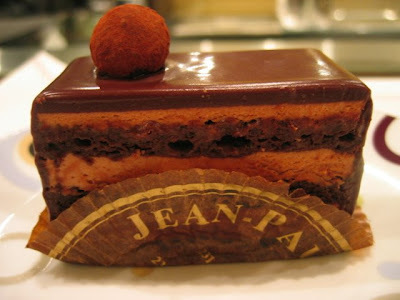 First up is Jean-Paul Hevin at Isetan in Tokyo. They have a cafe here, in addition to a retail shop. We had a seat at the bar in the cafe, and marvelled at the well-dressed staff in cute black caps, the dark wooden tables, and the conscientiousness of the service. They gave us lovely boxes to pop next to our seats to neatly contain our cumbersome coats and bags. Little details are so important. I am embarrassed to say that I don't remember the exact names of what we ordered - our trip to Japan was back in December (!! ), and I've only just got around to blogging this. However, I do remember that everything we ate here was incredible. 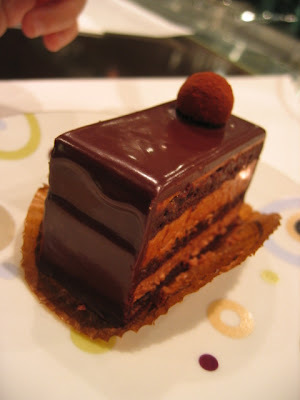 Mirror shiny-glaze, deeply chocolatey cake, chocolate cream, chocolate truffle. Amazingly, it wasn't heavy at all. Just perfect. 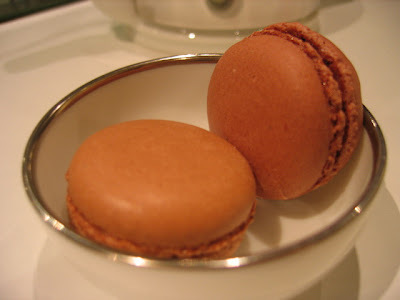 2 Macarons... I believe one was chocolate with raspberry filling, and I'm sad to say I can't remember what the other one was! Apologies to Jean-Paul Hevin. Hot chocolate. 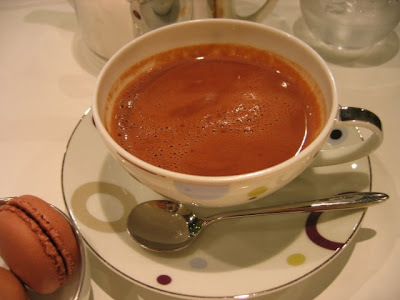 I loved that this hot choc had an intense chocolate flavour, without any overwhelming richness. 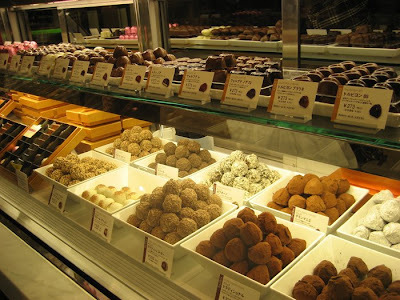 Some chocolate cafes in Melbourne use double cream in their hot chocs, which just leaves me feeling feral and overindulged without actually satiating my chocolate craving. No such problem here! 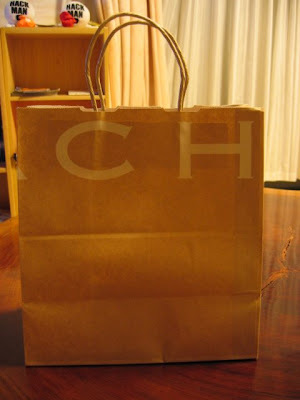 Next stop, Mitsukoshi department store in Ginza. I found myself gawking at the wealthy patrons as much as the shops. 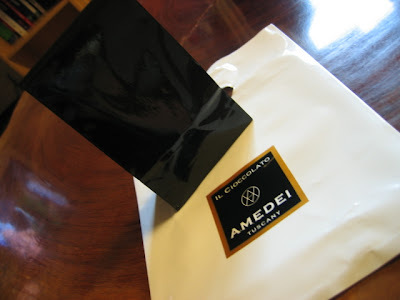 Amedei Chocolates. So stylish they should be selling handbags and shoes. I satisfied myself with 2 macarons. (See below). CUTENESS!!! 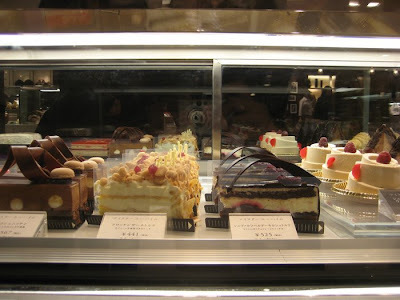 I am always impressed by the Japanese interpretations of Western baking! 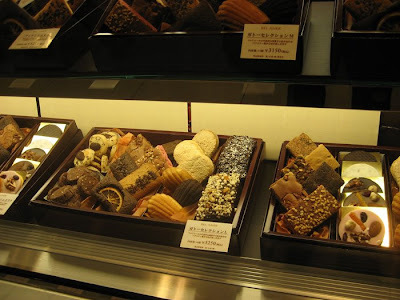 There didn't seem to be much room for eat-in at Mitsukoshi, so I bought my treats to go, and enjoyed them back at the hostel. 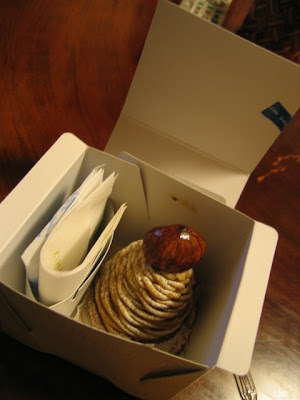 Finally, finally, I am posting about a Mont Blanc! This creamy-chestnut dessert is incredibly popular in Japan (pronounced "mon buran"), and available pretty much universally. Now, check out the packaging. 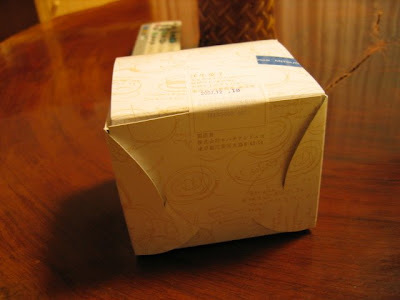 Japanese shops use heaps of packaging, but it's oh-so-cute! (However, I'm told that their recycling levels are leaps-and-bounds above ours). 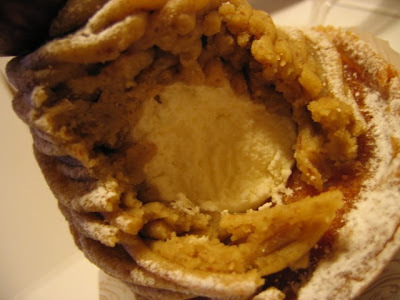 ...and a creamy filling, sitting atop a little almond tartlet. OMG. Having just watched a few Jdrama eps, the pics make me miss Japan so much! I wanna be in the basement of a Japanese department store too! 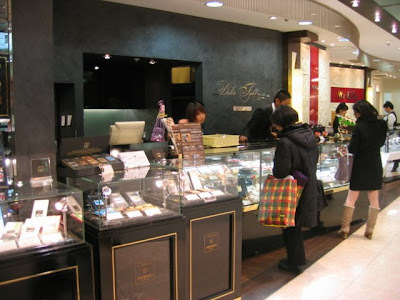 The Isetan basement next to my workplace in Fuchu was a favourite stop of mine for lunch. They often had awesome bento packs and stuff for reasonable prices. You know the macaroons we bought at Fuji-mart the other day? I never ate mine! I found it like a week later in my pantry - devastating. How were they? Mata ikou ne? Atashi maguro kaitain da yo. herushii ni taberu you ni shitain to omoimasu! How can you not eat valentine macaroons on valentines day?? Shame on you, Markii! 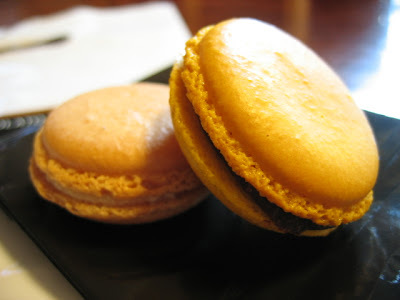 The macaroons were nice, nothing super special though. That green tea creme looked disgusting by the time we got home, it got shaken a bit in the car, lol. Let's do that thing that Sarah wrote in that weird languange! hehe. Yay! 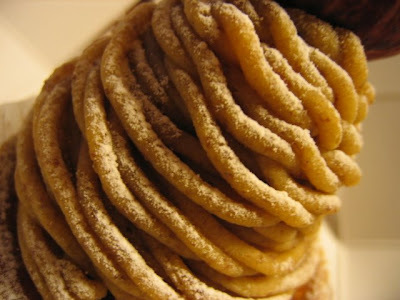 Mont Blanc! 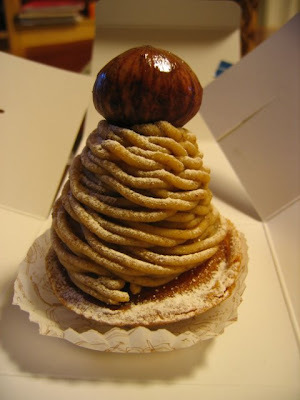 (This is the Hannah who seems to pop up whenever there's a mention of the Japanese Mont Blanc.) 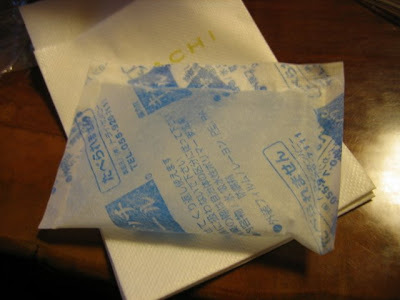 I have almost the same set of pictures of a ceremonious unwrapping of the Mont Blanc, although I might say that the packaging of mine, from Daimuru in Kyoto, was even flashier and looked like it should contain jewellery. 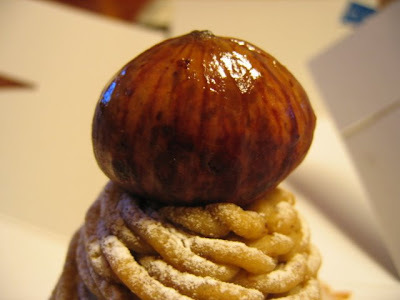 Mine also had edible silver leaf on top of the crowning glazed chestnut (It was called a Mont Blanc d'Argent, while the Mont Blanc d'Or had gold leaf and liqueur in it), and had an extra nubbin of chestnut paste within the cream underneath the mousse spirals. Okay, I have no editing skills when it comes to talking about this. Suffice to say I'm very excited to see you enjoyed such a treat as well! 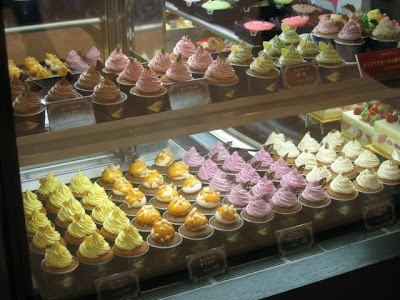 OMG, I'm going crazy over the insane amount of desserts there!! Japan is definitely going down on my 'MUST VISIT' list! Thanks for sharing the pics from ur awesome trip!